Previously I did some posts about the CustomUI editor. This nifty little tool makes it easy to create your own ribbon in the various Office applications. We have seen how to add your own ribbon, add icons to your ribbon and how to add a gallery to your ribbon. In this post I will show you how you can add a ribbon, a button and how you can assign an action to your button. 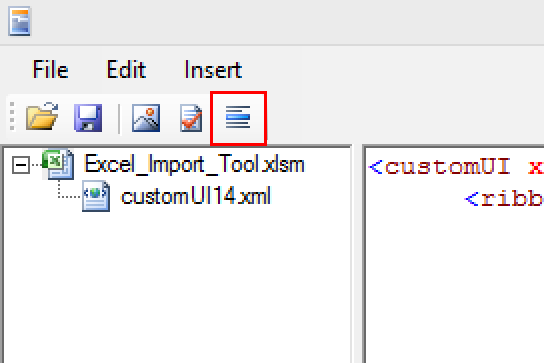 The example will show a userform in Excel when you click the button in your own customized ribbon. As always I will describe the steps to achieve the result we want. So let’s do this! First things first. Startup Microsoft Excel. It is important to know that there is a distinction in versions one might use but I will point those out to you. The example I made uses Excel 2010 (and beyond) but it is possible to use Excel 2007 as well. The first step we need to do is create a blank document in Excel and save it as ‘Macro enabled’ workbook. Why? Because we want to assign a macro to the button we will create in our ribbon and files which contains macro’s are mandatory to save as macro enabled workbook! Ok with the blank Excel workbook saved we can now open the CustomUI editor and start our journey. We will start from scratch. 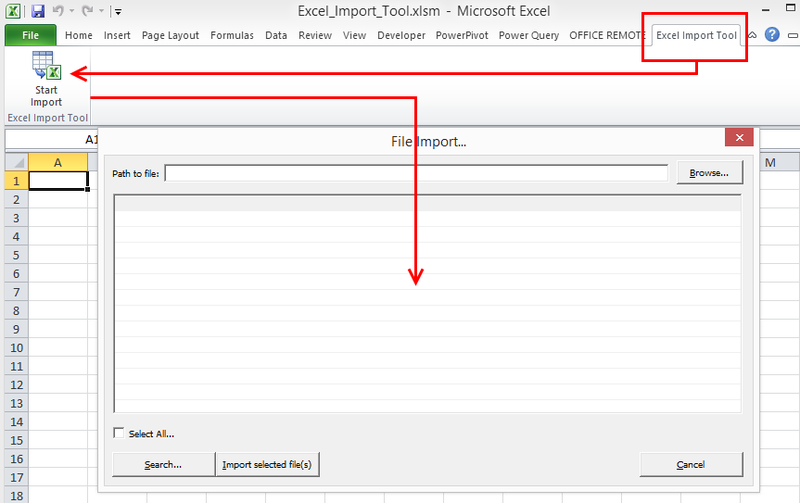 Choose open file and browse to the file you just created in Excel and click ‘Open’. Your Excel document will appear in the treeview. Now click on Insert from the menu bar. Important: this is where the distinction between versions is made. So if you are using Office 2007 choose the second option from the drop down menu otherwise follow the example. If you have selected one of the two options you will see an additional node appear in the treeview. You should see a little icon with the word custom next to it. Ok we are doing great so far. Now because we don’t want to reinvent the wheel all the time we are going to use some default XML code. Again go to the Insert option from the menu bar and from the drop down choose ‘Sample XML’ and choose ‘Custom Tab’ from the next menu. In the picture below you will see the modifications i have made to the existing XML to make it our own. I’ll describe the changes I have made. Changed the group id: this is important because the group id also has to be unique. can you explain why I chose ‘grpEIT’ ? Changed the button id. You know by now that this is important so make it unique. You might notice that I keep the names in sync with the other ID’s. Make sure the imageMso has a capital M because otherwise it won’t show the icon! The final piece is the onAction bit. This is where I attach my macro reference. Have the same output? Ok, just remember it does not do anything yet because the macro is not there yet. So if you click the button you would get an error! In the Excel file i created a userform (doesn’t have to be that fancy a blank userform will do). If you want to follow this example make sure the userform is called ‘frmImport’. Click insert – Userform from the menu bar and create your userform. Save your Excel file and we are ready for the next step. Adding a ‘callback’ from the customui editor. 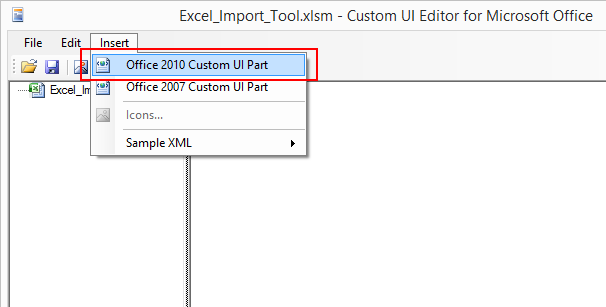 Open the customui editor again and open your Excel file. You should see the XML code you have created earlier. Now to generate the callback for Excel click on the last button in the menu bar as shown below: You will see that the custom ui editor will generate some callback code for you. Copy that piece of code and after that close the custom ui editor. The final step we have to do is add the actual action between the lines the custom ui editor created for us. In this case we want to show the userform when the button is clicked. So all we have to do is add the line: frmImport,show between the lines that are already there. Be curious… test your ribbon callback by clicking on your button in your custom ribbon! This entry was posted in Office Tips and Tricks, Toolbox and tagged Custom Ribbon, CustomUI Editor, CustomUI OnAction, Generate callback from CustomUI editor, Trigger Macro from Custom UI editor, Trigger your Macro from Ribbon, XML on December 15, 2014 by Maurice. I am just starting out changing the ribbon on Excel. I have much success in changing the ribbon, but then when I save using the editor, the excel workbook defaults to an empty workbook but with the new ribbon. How can I keep the populated workbook with macros and all but only change the ribbon? Good question. If you want to add the ribbon to your workbook with macro’s open that file in your CustomUI editor. Add all you want to add and just click save in the CustomUI editor. Your xml will be saved with your Excel file. When you open your file you will see your ribbon with that specific file. Let me know if that helps. Thank you for information. 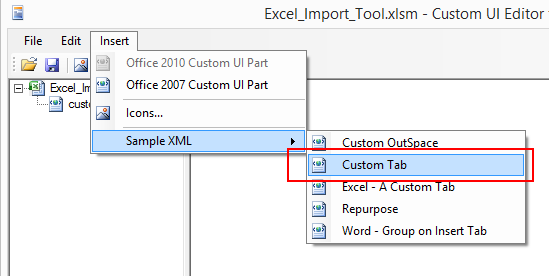 and now i want to add custom tab to outlook is it possible by using customUI editor.If it is possible please tell me the way like you said for Excel and word.Thank you in advance. Thank you for your feedback. You use a different toom to create your own ribbons for Outlook. You can use Visual Studio for Office Tools for that job (VSTO). Outlook doen’t have a spceific file to point to to create a ribbon the way we can in Word and Excel. Like in Access this takes a whole different approach. So in short: no you can not use the CustomUI to create a ribbon in Outlook. Thanks Maurice for the detailed article. I would like to add custom tab/ribbon in Word (ie., available for all documents), not just one document. I could try “Customize the Ribbon” option, but I could not use custom icons. Any suggestions? Thank you for your feedback. If you want your ribbon to be available for all documents then you would have to add the ribbon to your normal.dotm template and deploy that normal.dotm template to your users. That way everyone can use that specific ribbon. My advice however would be to deploy a seperate .dotm template and deploy that template to your users (place the template in the Word start up folder). The normal.dotm template might be subject to Office updates and you don’t want to take that chance. In case of a Word crash a new normal.dotm template will be deployed and you will lose all your hard work. So creat a separate .dotm template and deploy that one.